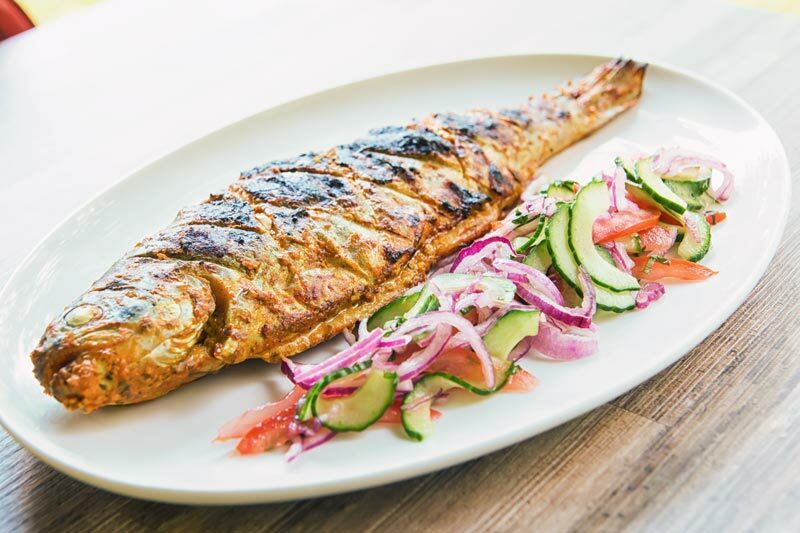 The barbecue is a great substitute for a tandoor oven as this whole BBQ tandoori fish demonstrates. 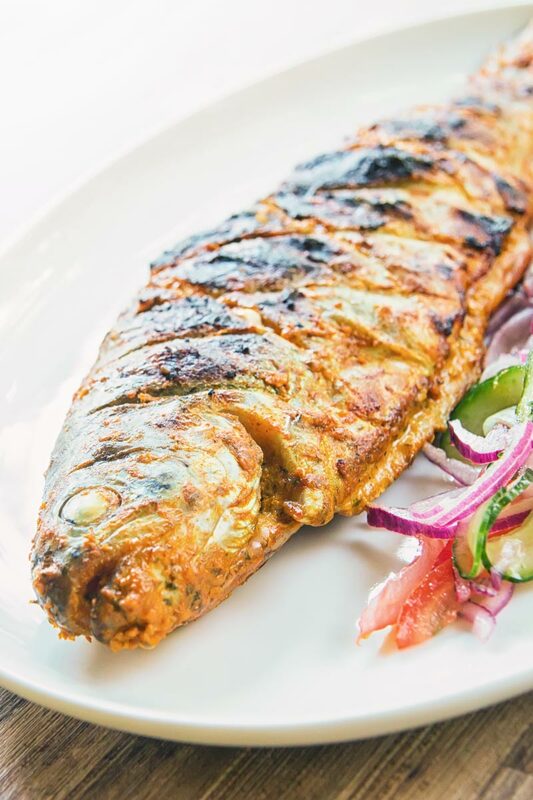 A whole trout in glorious Indian Spices cooked to perfection! Indian food is definitely one of my favourites and I love tandoori, so here is my whole BBQ Tandoori Fish. Like my BBQ Tandoori Chicken recipe, this tandoori fish recipe uses a BBQ in lieu of a tandoor oven. The great thing about cooking on a BBQ is the extreme temperatures you can reach. A tandoor oven can often reach 500°C, double most conventional ovens. Whilst a barbecue cannot quite reach those temperatures they do bridge the gap. This is the reason that my BBQ Chicken Pizza cooked on the BBQ works so well. The fish in this recipe is definitely not just a texture. As a result, the flavours are scaled back, see what I did there, to allow the flavour of the fish to shine through. Whilst we are on the topic of this fish, this is a tandoori trout. You can use any fish that cooks well whole on the bone. Think, zander, bream or even bass. What is the difference between Tandoori Fish and Fish Tikka? In general, the difference between tikka and vindaloo is that tikka tends to be ingredients cut up fairly small and cooked on a skewer in a tandoor. Tandoori recipes, however, tend to use larger pieces of protein cooked on the bone. So it would be very simple to play around with this tandoori fish recipe and turn it into fish tikka by using boneless fillets. Something like cod. pollock or salmon would work wonderfully. In fact, you can then take this a step further in the genesis of Indian food. A tikka masala like my duck tikka masala or chicken tikka masala are tikka recipes finished in a masala sauce. I keep telling you that this cooking malarky is simple. The only difference between a tandoori fish recipe and a fish tikka recipe is the bones. The only difference between a tikka masala recipe and a tikka recipe is a sauce. How To Cook A Whole Fish On The Barbecue. This is the second whole trout recipe I have here on Krumpli. 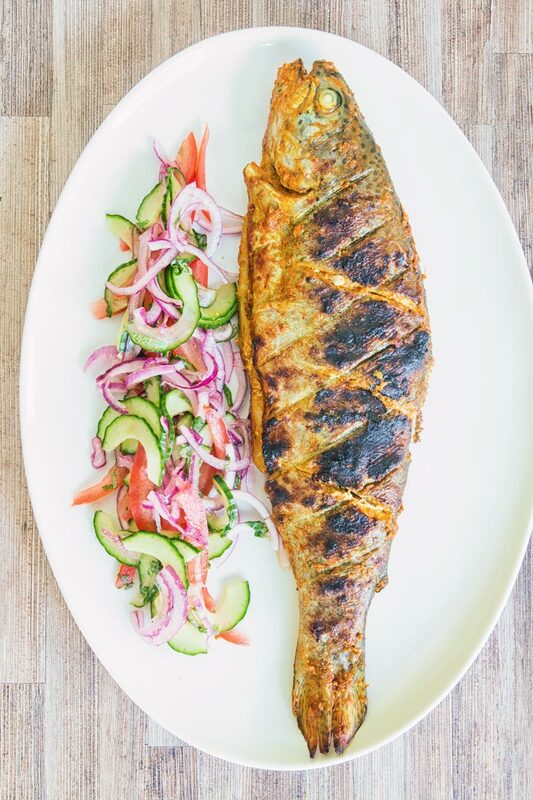 Like this tandoori fish recipe, the other involves cooking a whole fish on the BBQ. The process is stupidly simple, really hot coals, brush your fish grill or fish with oil. Then it is a simple matter of cooking over the direct heat of the coals. 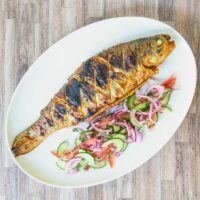 Naturally, if your fish has marinaded like this fish tandoori recipe then brush your grill with oil rather than the fish. I personally prefer cooking my whole fish on the barbeque in a fish cage, they cost pennies really. Whilst they do not offer any better cooking they make flipping the BBQ fish so much easier and less prone to breaking. You can, of course, use a fish slice to flip your fish, however, make sure it is a long one! 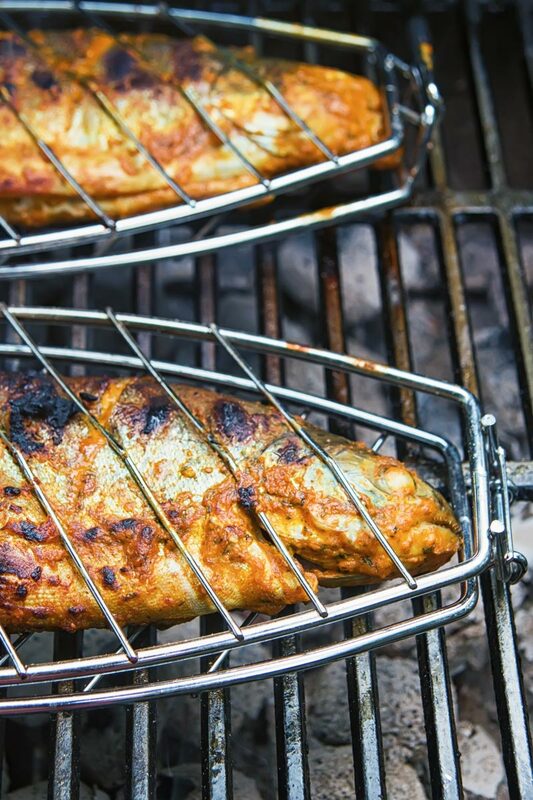 Cooking tandoori fish on the BBQ is the perfect substitute for a tandoor oven. This recipe shoves dodgy sausages and burgers to one side and brings a touch of the exotic to your summer BBQ! Add all of the ingredients for the tandoori marinade (except the yoghurt) to a blender and add the zest of a whole lemon and the juice of half a lemon. Blitz to a fine paste. Cook this paste over a medium heat for 3-4 minutes and transfer to a bowl. When cooled add the yoghurt and place in a bowl large enough to hold the fish. Make 3 or 4 deep slashes in the flash of the fish and rub in the marinade, including in the cavity and allow to sit for an hour. Cut your red onion into thin half moons. Deseed and thinly slice your tomato into strips. Remove the seeds from your cucumber and then thinly slice. Combine the cucumber, tomato and red onion in a bowl. Chop the mint leaves and add to the bowl. Add the sugar, salt and remaining juice from half a lemon and let sit until ready to serve. When your coals are hot, brush the grill plates with oil and add the fish in a fish cage over the direct heat. Cook for 5 minutes before flipping and cooking for another 5 minutes. Cooking times will vary depending on the size of your fish. Great flavours Brian. I made this yesterday and we all loved it. 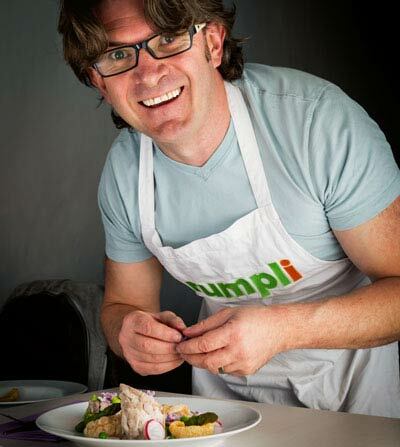 Haha – you sure make “this cooking malarky ” look simple! I don’t think I’ve ever cooked a whole tandoori fish – and now I am hungry even though I had breakfast less than five minutes ago! This looks absolutely amazing Brian! I’ve never had fish tandoori before. The flavors sound so yummy! You really must, it is so good! You did an absolutely gorgeous job on this fish! I would love to have this sitting in front of me. It sounds full of flavor and I love how you grilled it. This looks delicious, so far we have only made salmon on the grill but your directions are great and I think we will try this soon. 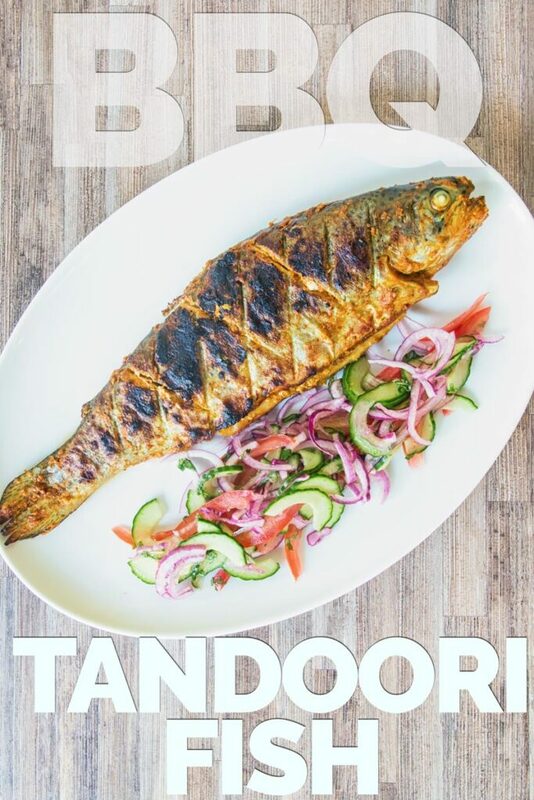 I love tandoori fish, even though I have never tried making it at home and it’s one of my favorite Indian main courses. Looks so delicious and easy enough for me to be able to make it myself 🙂 Thanks for a great recipe. Definitely very easy and so incredibly tasty!